Type A4 Quick Attachable Chest (QAC) Pack. Manufactured by Irving Air Chute Co. Lexington, Kentucky. Dwg. No. 44J9221. Group 2 'Yellow' pack for the quick attachable chest type parachute harness. 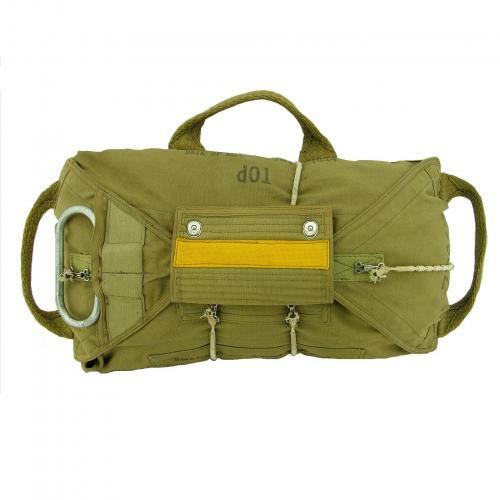 Olive drab cotton duck material with heavy webbing grab handles on 3 sides. Yellow patch sewn to the ripcord flap indicating that this is a Group 2 'Yellow' pack for use with harnesses with snap hooks. Complete with cadmium plated steel loops for attaching to the harness. Also fitted with correct ripcord handle/ripcord and bungees (the latter rather worn). Marked with drawing numbers, serial number and clear July 6th 1944 manufacture date. Pack only - the canopy is absent (pack stuffed for photographing and will be dispatched empty). Light soiling only and in excellent used condition overall. Stock code S21135.